Captain's Log Starship 1XE, Day 13 in the month of February in the Earth Calendar Year of 2016. 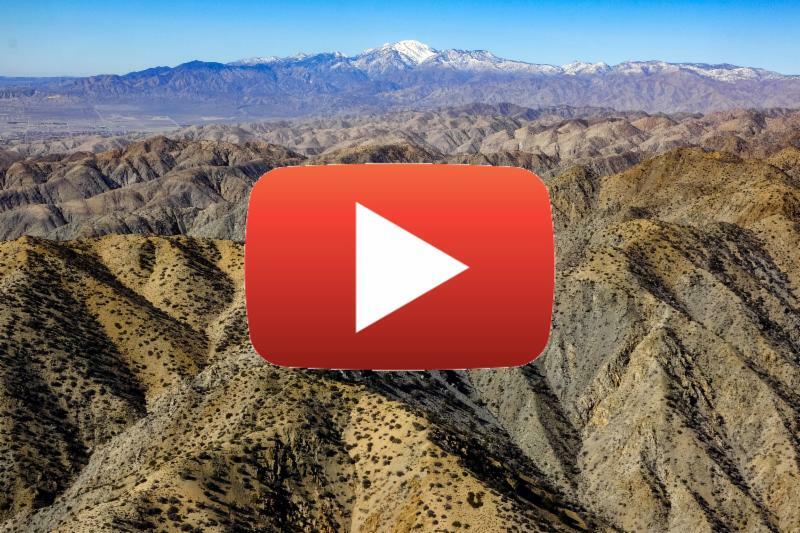 Video: 3 New National Monuments! A vastness enfolds ahead, under and behind our ship. The steady hum of the engine envelops us and we are grateful for the smooth air, the quiet and the magnitude of the landscape passing below us. The great Sonoran and Mojave Deserts come into view as we navigate restricted airspace where bombing ranges abound. We slow the aircraft, open the window and a rush of noise and wind hits us as we focus our camera lens to produce many of the images you will see of the newly created Castle Mountains, Sand to Snow and Mojave Trails National Monuments. This is our mission as we head to Palm Springs to fly politicos, media and concerned citizens who appreciate and will tell the story of the importance and unique attributes of this fabled land. The monuments that were introduced just a week after our flights are part of a historic effort that dovetails on the vision and legislative efforts of Senator Diane Feinstein's Desert Conservation and Recreation Act. Legislation in this time of political discord is improbable, so proactive efforts were taken by the President to protect some of the most sensitive areas in the region, creating connectivity to other protected lands that make up the heart and soul of the Mojave. It is an area of unparalleled beauty in a harsh and unforgiving environment. The people that inhabit the region are tough and resilient, and as we were to discover, incredibly generous with their time and concerns. Photographic mission of the day accomplished, we turn to the small town of Twentynine Palms to fill up the mother ship with self-serve gas at the great price of $3.99 a gallon, compared to Palm Spring's gouging $7.93 a gallon, where they must think every plane is owned by Frank, Dean and boys of the Rat Pack. As Janey remarked on touch down at TNP "one of your better landings"; but it still didn't prevent us from rolling to a bumpy stop in the middle of runway 26 with a seriously flat nose tire. 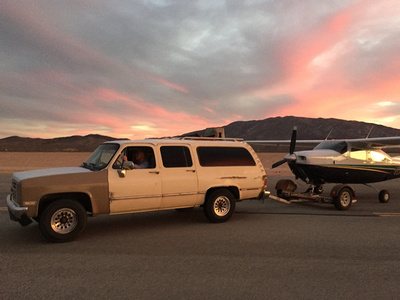 This short story is supposed to be about our amazing desert flight missions and the landscape we were helping to protect, but no landscape stands alone; there are also the people who live on or near that landscape. The people of Twentynine Palms were heroic and generous with their time, their equipment, and their aviation know-how. Janey in charge, a car dolly was appropriated to tow the plane off the runway, a pick-up truck to winch the weight of the plane off the nose wheel, and I took off into the sunset (literally) with a marine fighter pilot who offered to fly me in his new aerobatic plane in search of a new tube and tire for 1XE. A more unlikely story could not be imagined. To make a long exciting story short and boring, my F18 pilot and I landed back at Twentynine Palms in the dark, with no landing lights, simulating a stealth landing on an aircraft carrier; flashlights and lights from the pickup lit the way for the mechanics to change the tire, and being too late to fly to Palm Springs, we headed for the closest tequila bar with Janey and her band of good Samaritans. The rest of our days were packed with excited journalists, politicians and concerned citizens all buoyed up about upcoming protection of the Californian desert and the imminent national monument announcement. The generosity and spirit of the people of the Californian desert will not be forgotten. Let's tip one to the desert folks of Twentynine Palms. Home > Captain's Blog > February 2016 - Three New Monuments!